Add an extremely high performing HF spindle with ATC (automatic tool change) to your High-Z or T-Rex CNC machine. The ATC-Series spindles have a pneumatic cone change for best use in part or fully-automated production processes. We ship with SK20, SK30, SK40 and HSK25 interfaces by default, additional construction types can be delivered upon request. The ATC-Series motor spindles are the right choice when achieving productivity goals by automated tool change without any length measurement after the change. The ATC-Series provide an automatic tool change suitable for your semi- or fully-automated production process. Several possibilities to optimize your cycle times are given through cone changes within the SK-, HSK and Direct-Exchange technology interface. Thanks to sophisticated production processes we achieve run-out tolerances under 2µm in the cone; this contributes not only to a reduction of tool wear, but significantly to the achieved surface quality of your work piece. 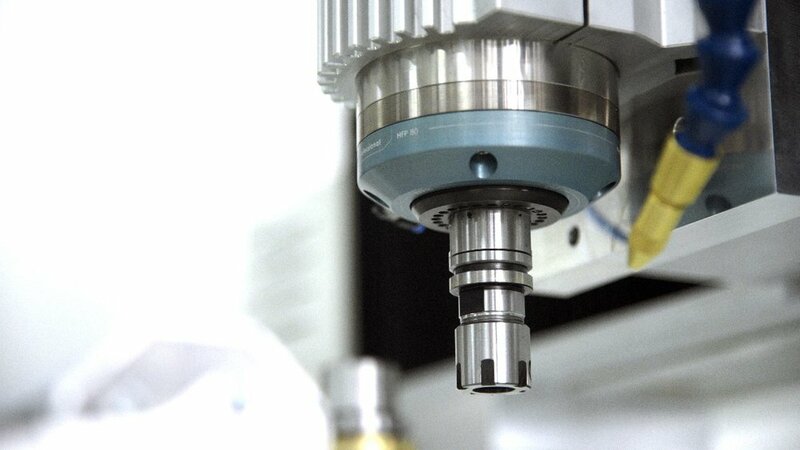 High-speed machining is a modern manufacturing process with extremely high demands on the spindle. The ATC-Series contribute by delivering excellent machining results while preparing the technical base for future pioneering technologies. The spindles of the DTC-Series are equipped with a pneumatic direct tool change for best use in part- or fully-automated production processes. As standard we deliver our spindles of the DTC-Series with a WZF06 clamping collet within a clamping range from 3 mm to 6 mm.